It’s not simply about gap filling. Find out more about choosing the right spray foam filler for your application, with TradeFix Direct. Foam isn’t the only material that can be used as a filler but it seals cavities more effectively than fibreglass and other alternatives, is easier to work with, and it won’t sag over time. 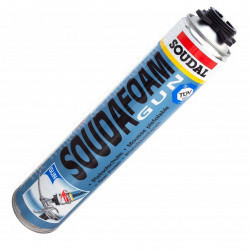 In addition, foam filler is typically a better insulator than alternatives, and can reduce noise, support structural strength and reduce the volume of dust, pollen and other airborne contaminants within a building. Once cured, foam fillers can be cut, sanded, sealed or painted. 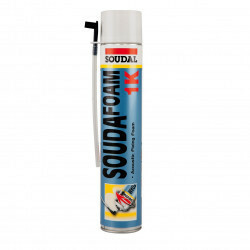 Specific properties vary from foam to foam, so it’s important to check the specifications and compare products to ensure the filler you’re looking at is the one best suited to your application. 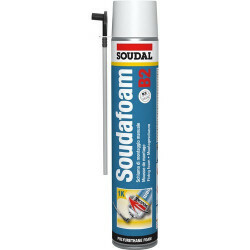 Ensure your foam will stick to the surfaces to which you’re planning to apply it. Most TradeFix Direct foams are designed to adhere to all common building materials including brick, timber, plasterboard, metal, stone and many plastics. Foams may be less effective on substrate including PE, PP and Teflon. 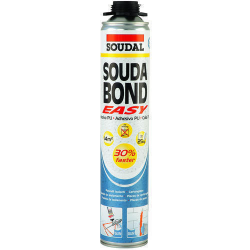 For bonding in drylining and insulation applications, choose Soudabond Easy PU expanding foam adhesive. Virtually every filler offers some form of resistance to moisture, temperature and air permeability. 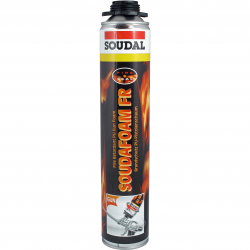 Some offer greater fire resistance than others so it’s important to check the fire rating of your chosen filler. Few foam fillers are UV resistant and will begin to break down if left exposed. 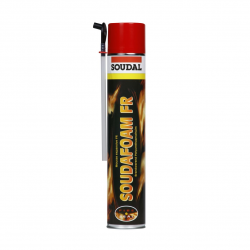 Ensure the foam is plastered, sealed, painted or otherwise covered after curing. Some gap fillers offer greater thermal insulation than others. Some are highly flexible, limiting any potential for cracking over time. 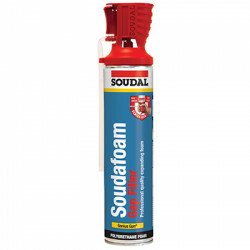 And some are ideally suited for window and door fixing applications. 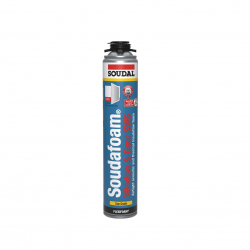 This Soudal Window & Door Expanding Foam, for example, is quick curing, particularly durable and can be applied at temperatures between -10° and 30°C. Gun grade or hand held? 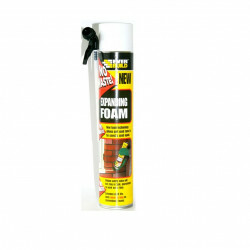 Foam cans have two alternative delivery systems. 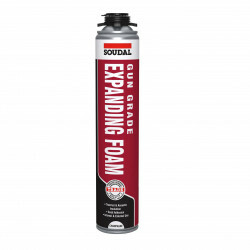 Gun grade cans are designed for use only with a foam delivery gun. The gun makes it easier to control the rate of delivery and ensures a more precise application of foam. Handheld cans provide extra convenience. Without the need for a gun, they’re handy to keep as part of a toolkit and ideal for quick fixes. With no gun carriage to clog, they can be a less messy option too. 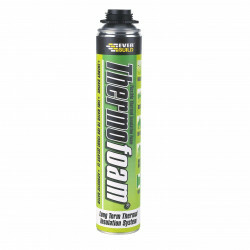 Look for cans that use CFC-free propellant to minimise the environmental impact of your work. 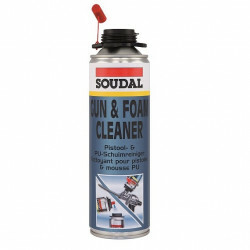 Keep a can of gun and foam cleaner to hand to keep your gun and surfaces clear of uncured foam filler. 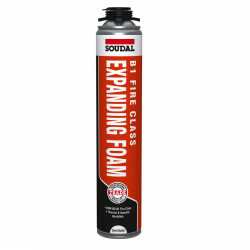 Don’t fill enclosed spaces with foam. By its very nature expanding filler needs room to expand. Expansion rate can be surprising. Always places dustsheet or similar beneath working area to collect spillage. 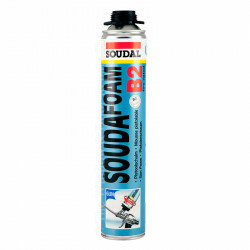 Which is the right spray foam filler for you? If you need help, call us now on 0161 794 1783 before you buy online. There are only 52 of this item in stock. There are only 102 of this item in stock.